This is a playground that, young or old, can’t fail to put a smile on your face. 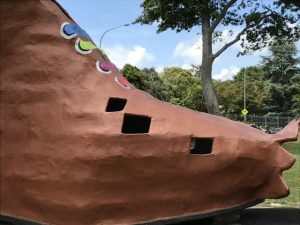 Whether you’re looking to break a journey or staying in the area, it has been around and much loved by kids for decades. The playground reopened in early 2016 after being damaged by flooding but the old favourites remain. 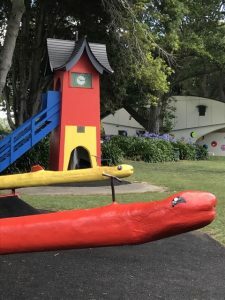 This isn’t a conventional playground, animals and nursery rhymes are themes for much of the brightly coloured equipment; there’s a dinosaur slide, swings hanging from the tentacles of an octopus, snake seesaws and an old ‘shoe’ hiding a slide. There’s also a pirates ship, rocket ship and tunnels under a climbing rock. 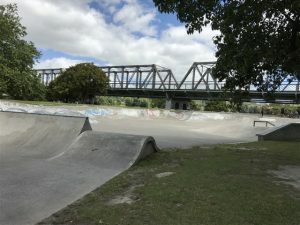 Much of this equipment is aimed at younger kids (perhaps 6 years and younger) but there’s also a long flying fox which you access from a fort like structure over near a great skatepark. An addition to the playground equipment since the flooding is a disability swing. Within this park there’s also BBQ facilities with a covered (by a giant pumpkin) eating area. There’s a bike park and water play fountains in the summer months. There are also train rides at the weekend and during the holidays. Address: 96 Anzac Parade, Whanganui East. There are several car parks off the access road near the playground. Open: daily, dawn till dusk. Train operates 1-3pm Weekends and during the school holidays, costing $2 per person.